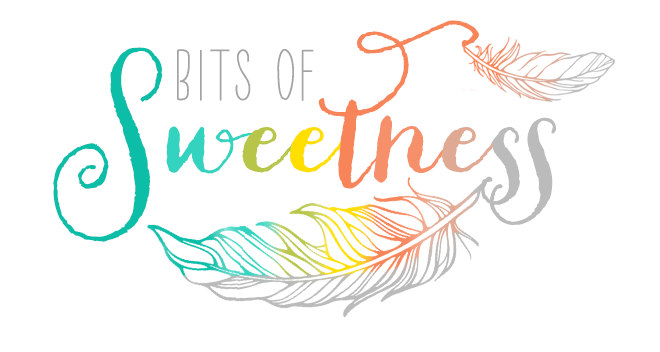 Bits of Sweetness: Creating an awesome kids' art space! 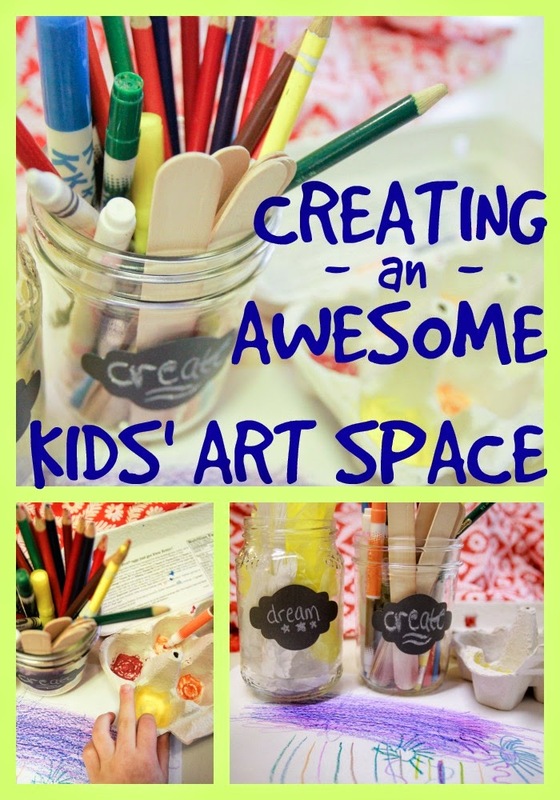 Creating an awesome kids' art space! Thanks to Kidecals for providing the product to test out! All opinions are my own! 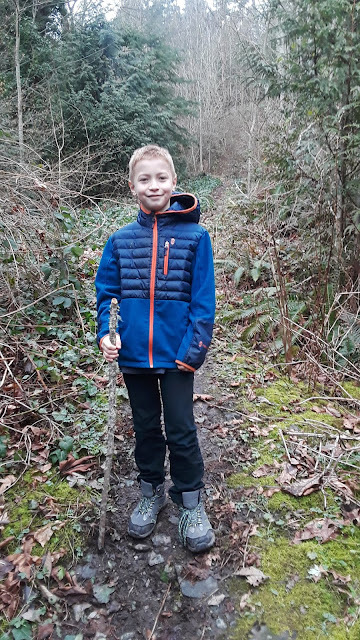 Accessible and fun are the key words! After all, if we don't give them the chance (even just occasionally!) kids won't learn skills like self control and organization! We love repurposing things around here. In fact, Adrian and Andrew both try to rescue things from the recycle pile to be used for art projects! Paper towel tubes are favorites around here! They make awesome swords and telescopes. Today's repurpose was an egg carton. I added markers, craft sticks, glue, and colored tissue and let Andrew go to town. It's funny how much happier the boys are when I stop trying to mandate how much of a mess they can make and just let the fun happen. Suddenly beautiful pieces like this are drawn and awesome creations made that definitely don't see the light of day (or, our kitchen table) when I'm too involved. 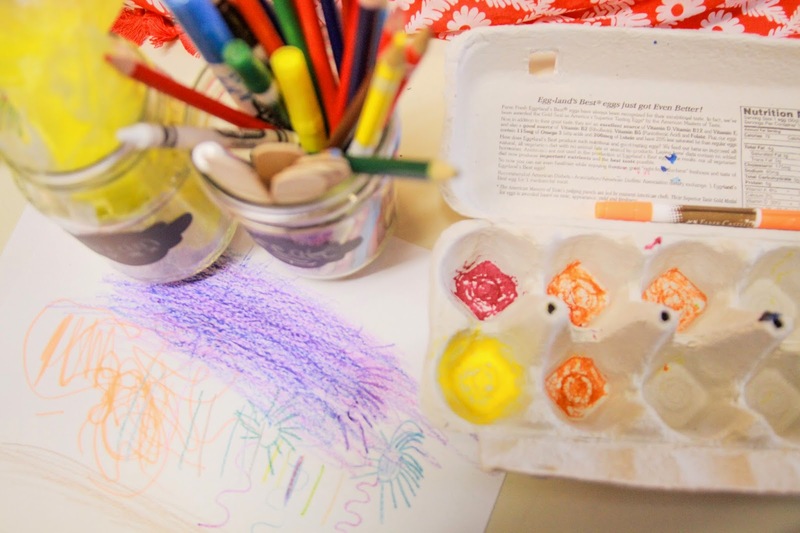 Creating an awesome kids' art space is halfway about providing the materials and halfway about stepping back and just letting creativity flow. It's been neat to see what they've come up with so far! I've had fun thinking of ideas for them to do on cold and rainy days! 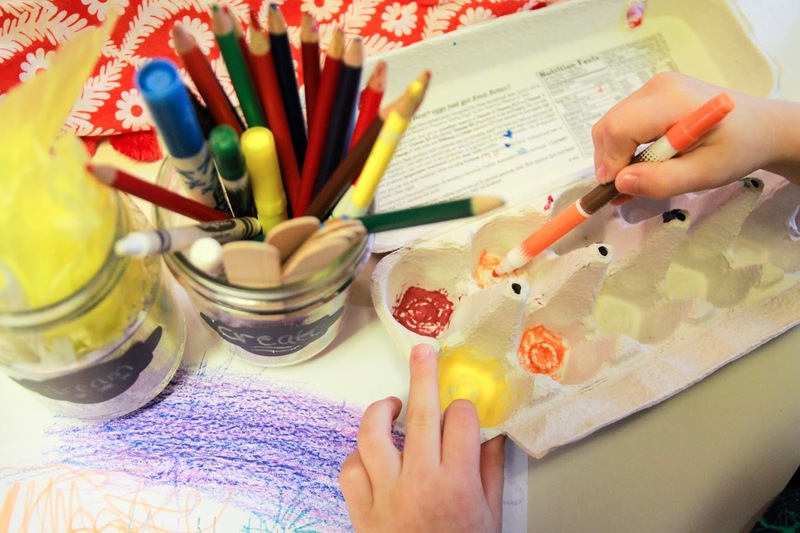 Check out our Pinterest board here and find a few fun ideas to promote art fun for your kiddos! 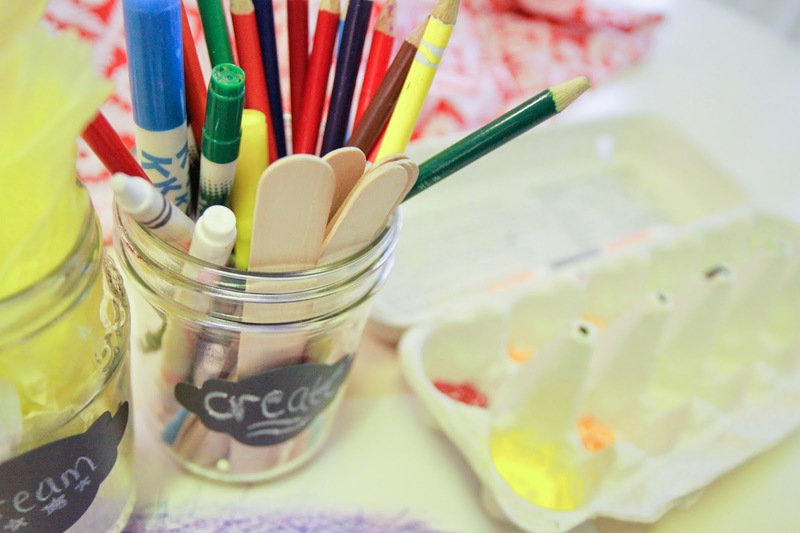 What are your favorite ways to let your kids create? 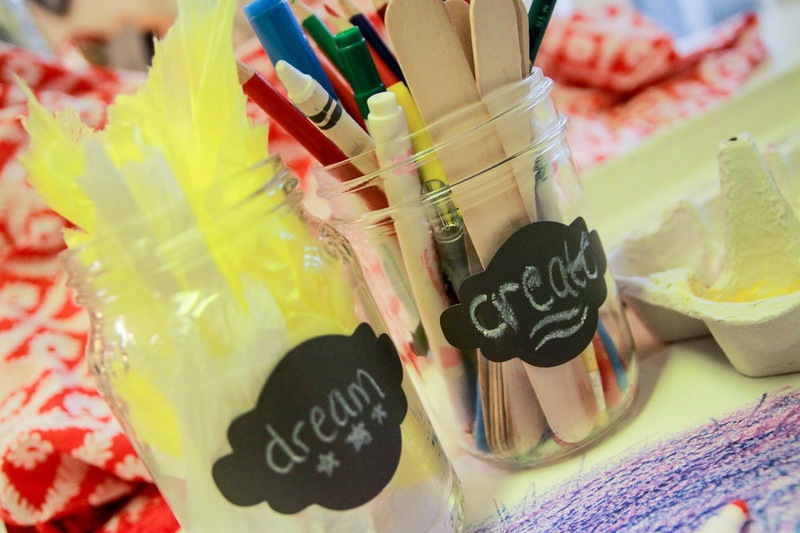 Love the mason jar ideas with chalk paint! 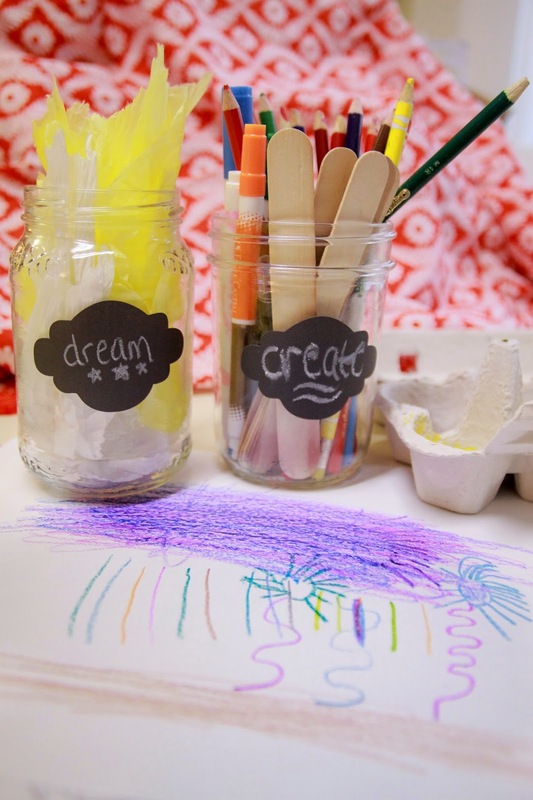 Cute:) The mason jars, labeled, are such a great idea! 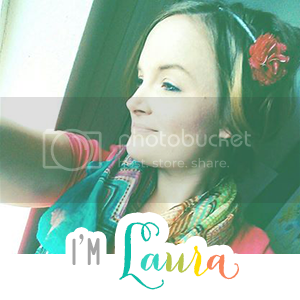 This is great, my daughter loves to create. I'm redoing our classroom art section now, thanks for the great ideas! Aw when my baby is a little older I would love to make a space like this for her! I've been trying to plan this out for my son's playroom, thanks for all the great tips! Our girl's LOVE creating every.single.day. Love the use of the egg carton! Genius! that's such a good use of an egg carton! :) we don't have kids, but i might actually use that idea when painting! How much fun, my boys would love this! 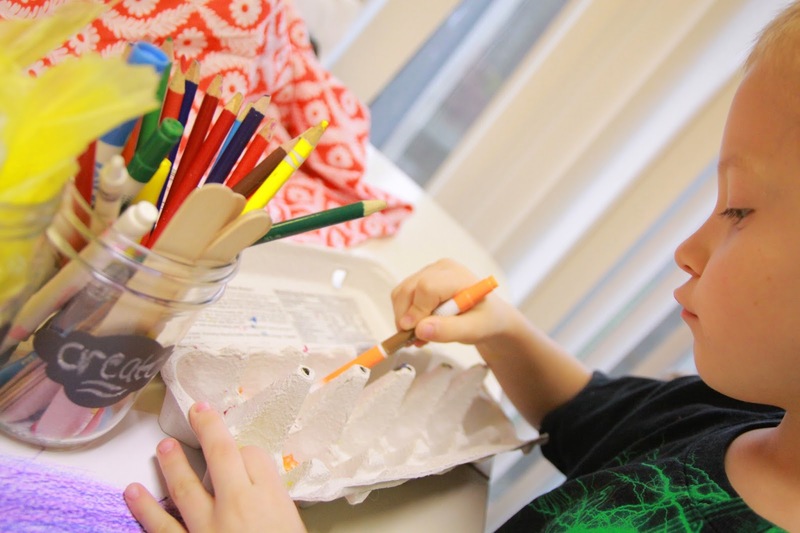 My mom used to put paint in egg cartons too! I love how creative we can get with spaces now. We had a great space set up but had to take it down as my daughter is in the grab-everything-you-can-and-eat-it phase, so it will go back up once she's ready to start painting and creating :D Love this! This looks like such a cute space! I use a little hand crate for my son's art stuff. This is such a cute personal space for kids. I love how positive and inspiring the labels are too! This look so fun. This kind of project is on my TO-DO list for next year for sure. My kids need a space to read, write, and color. My kids have a whole half of our living room as their play/art area. They love it. You have some really great ideas here. Love these ideas!!! My daughter has really been into art lately and I like the idea of setting up a little area for her! i totally agree...i have to learn to embrace the mess! Awesome stuff! Creativity is so necessary. Amazing ideas and tips! It's so important to have a place to create and do art!